Please see important details below regarding shipping chocolate products to warm areas! 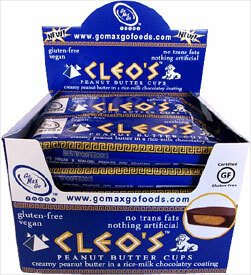 Cleo’s Peanut Butter Cups are so rich and creamy, you won’t miss those non-vegan “other peanut butter cups” after you’ve had these. Go Max Go’s one-and-only rice-milk chocolatey coating cuddles the creamiest, dreamiest, peanut butter filling ever! With 2 cups per 1.5 oz. (43g) individual package, this box of 12 individual packages is just $26.89 so you'll save 10% off the normal price! *NOTE* - Chocolate can melt in the summer heat, especially if your destination area temperature is in the mid 80s or above when the package takes more than a day or two in transit. We recommend expedited 2nd Day Air shipping and the addition of a cold shipper (offered below) for orders where you want to minimize the risk of melted chocolate, and that it is delivered where someone will be there to accept the package at time of delivery (work address if not at home). The link to select a cold shipper is shown below, please click that link to be able to add the appropriate cold shipping supplies if you wish to protect your items during the hotter months. We cannot accept responsibility for melted chocolates, so please order at your own risk! Allergen This item is manufactured in a facility that also processes dairy, eggs, wheat, peanuts, and tree nuts.